Vitamin B-17 is known as an anti-cancer Vitamin and is found in many foods, but few that remain on the modern food menu. It's found in the seeds of apricots, peaches and apples and bitter almonds. These seeds are bitter to taste; making it the most likely reason why no one wants to eat them. While most may think they are poisonous and should be avoided, they are harmless as long as eaten in moderation. For example if you eat the flesh of the fruit along with the seeds you'll be fine. If however you decide to eat a whole cup of apple seeds you could end up with cyanide poisoning. It's really no different than with any other food. If you eat too many candies you'll end up with an upset stomach. If you eat greasy foods you'll end up with heart disease. Drinking to much alcohol can cause alcohol poisoning. 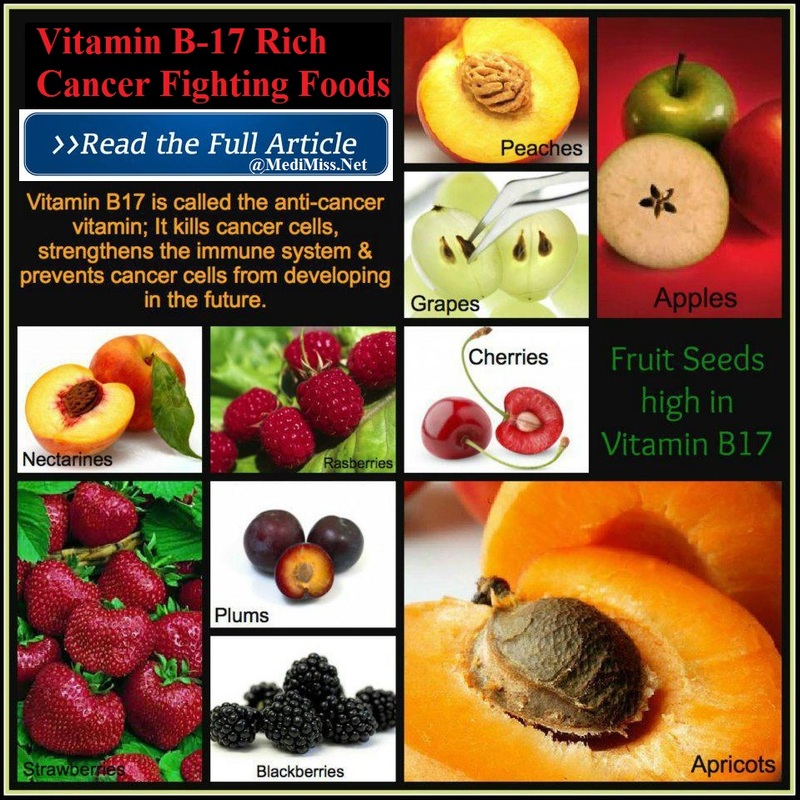 Here is a list of food high in Vitamin B-17. By eating these foods in moderation, on a daily basis and refraining from other junk food we can live long, healthy lives without having to worry about becoming a victim of cancer. Black beans, Black-eyed peas, Burma, Chickpeas, Fava, Garbanzo, Green pea, Kidney beans, Lentils, Lima beans, Mung, Rangoon, Scarlet Runner, and Shell. Blackberry, Boysenberry, Chokeberry, Christmas berry, Crabapple (Wild), Cranberry, Currant, Elderberry, Gooseberry, Huckleberry, Loganberry, Mulberry, Quince, Raspberry, and Strawberry. Oat groats, Barley, Brown Rice, Buckwheat groats, Chia, Flax, Millet, Rye, Vetch, and Wheat Berries. Acacia, Aquatic, Johnson, Milkweed, Sudan, Minus, Wheat Grass, and White Dover. Alfalfa, Beet tops, Eucalyptus, Spinach, and Watercress. Bitter Almond, Cashew, and Macadamia. Apple, Apricot. Buckwheat, Cherry, Chia, Flax, Millet, Nectarine, Peach, Pear, Plum, Prune, Sesame, and Squash. Alfalfa, Bamboo, Fava, Garbanzo, Lentil, and Mung. Cassava, Sweet Potato, and Yams.